A cursory glance may give the impression that Feuars Wood is a solid block of conifer: first impressions are often misleading! On closer inspection, along recently cleared trails, is a must and reveal the inner secrets and surprises of this wood. Although mainly a young conifer plantation consisting of Norway and Sitka spruce with a scattering of larch, the planting has left numerous delightful mini glades, each filled with small self-seeded birch and an occasional willow. The mossy floor has sprouted dozens of honeysuckle shoots, each of which looking to hitch a ride to the top of the canopy. Delving deeper into the wood reveals a large glade occupied by two large sweet chestnut trees. Not usually found this far the north, the seeds are obviously viable as several other specimens can be found hidden in the wood. A woodland bench sits on the edge of this glade offering a respite in the heart of this tranquil and hidden wood. This location would make an excellent, secluded, overnight camping spot. The northern area of the wood, close to the excellent track, gives way to a gentle south facing slope which then clears and levels again. The boundary of the wood there is the dry stone wall/bank ahead. In between runs a water channel created to drain away to the east, providing a very valuable oasis and added diversity to the ground conditions. The gentle flow attracts damp-loving plants and is doubtless a breeding ground for native amphibians. Hardly a visit to the wood goes by without the flash of a white tailed rump being seen, receding into the trees. 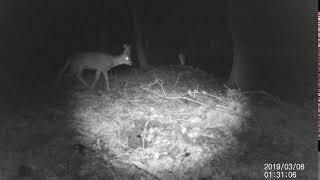 Its owner, the native roe deer, is active throughout the day but more often seen at dusk and dawn. Standing deadwood throughout the wood is a welcome home for the less than common green woodpecker. The staccato beat of beak on bough is an unmistakable indication of its activity. At various point throughout the wood, there is a pleasant aspect over the surrounding undulating farmland with the Lammamuir hills giving a darker backdrop on the horizon. Little known outside the area, the hills have several excellent walking and cycle tracks to explore. The feuars of Gifford were small landowners who had rights to cut peat and graze cattle on common land in the local community. This picturesque village is located on the Gifford Water and dates from the 17th century. It was built to replace the village of Bothans, which was demolished to make way for a walled park around Yester House, and housed agricultural workers from the estate. Although the area is largely agricultural, several industries were previously centred here. A sizeable textile industry producing fine linen, and a paper mill which once supplied bank notes for the Scottish banks, are the most notable. A viewing of the wood is definitely recommended; please allow yourself a generous amount of time to fully explore the wood throughout. The southern boundary is marked by red markings on a dry stane dyke, the other three boundaries by red painted topped fence posts. Feuars Wood is about 25 miles east of Edinburgh and about 35 miles west of Berwick on Tweed. For Directions From Bing Maps CLICK HERE enter your own postcode (Feuars Wood entrance coordinates are already entered) and click on the blue "Go" box. At the t junction turn left and continue for about 700m, the entrance to the wood is via a well marked ridestop on the left.